Welcome to the year of the Kingdom, the glory and the power of God! 2012 has trained you but 2013 will enthrone you. The nations shall tremble at the glory that shall be revealed. It is the year of the glory and My glory shall bring you into limelight. Yes, subdued by the power of the kingdom within you manifesting through you. Now rise in the impartation of the Spirit of might. Go forth to fulfill that which the Spirit bids thee to do. And as you go on, clearer it shall become, and the little shall multiply. The increase you seek is in the field, go and dig it out! Do not pay attention to the terror and evil reports of the world. For the just shall live by faith and not by world economy of bad reports. You must learn to forget it even as I do. For I am merciful unto your iniquity and your sins I remember no more. I call you saints and not sinners, I call you children and not slaves, for I love My family. For the glory that shall elevate you in the new! Be courageous, yes, be courageous! The blessing is upon you and you must be confident in that which I put within you! For it shall make more room for you. For the enemy of your soul shall attempt to pull down many even through the media. Forgive freely no matter the condition; forgive as I’ve forgiven you. Or forge you into another shape like it has already done unto many. You’re justified! You’re purified! Your life is blood-bought! You’re redeemed and the Father smiles upon you! The glory, the honor and the power shall multiply as you walk the path of love. Yes, love shall make you great! And love is the greatest, no spiritual gift is of use if separated from love. For whosoever is born of God keepeth himself in love and the evil one toucheth him not. Pay attention to My Word and override the report of unbelief with it! It is a year of kingly rule, a year of authority, order and power. And by My light you shall pierce all the darkness that is in it. But there is grace and glory for My bride because of righteousness. Come-on royal priests and kings, rise up in righteousness, you’re beyond condemnation! The onslaught of darkness cannot subdue the armor of light. Rise up and rule, exercise authority and be confident! Take your place and walk through the open doors I’m setting before you. Be not afraid for I am in you, with you and for you always. For where in the past you think you have failed, there’s new strength for you to succeed now. I am Love, keep yourself in me, I am Light, no darkness in me. And you shall reign in life through righteousness, love and power. My peace I give unto you, not as the world gives. Be not afraid, but have faith in My unseen presence, in My reality within you. 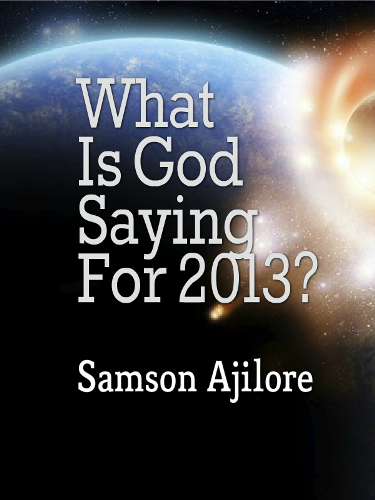 This is 2013 and I say unto you, come into the perfect love that casts out fear for fear has torment.